Diabetes and cancer, which affect millions of people world wide, are among the many disorders that involve alterations cellular regulation. The addition and removal of phosphate from proteins plays a major and essential role in cellular regulation. For example, glycogen metabolism, cell division and transcription are regulated by protein phosphorylation and dephosphorylation reactions. In order to understand how phosphate levels in proteins control key cellular events and how they may be altered in disease processes, it is necessary to understand the functions and regulation of the protein kinases that attach phosphate to proteins and the protein phosphatases that remove the phosphate. Knowledge of these processes may provide potential drug targets for the treatment of the many disorders, like diabetes and cancer, caused by both genetic and environmental factors. The research of my laboratory investigates the intracellular protein phosphatases that dephosphorylate serine and threonine residues, such as protein phosphatase 1 (PP1), PP4 and PP5. PP1 is controlled by a great variety of targeting proteins, which confer special properties upon the PP1 catalytic subunit and thus enable it to regulate diverse functions. Complexes of PP4 that regulate critical cellular events are currently being discovered, while PP5 may regulate multiple functions with a single regulatory region that is attached to the catalytic section. Using a multidisciplinary approach, we are delineating the physiological roles of particular protein phosphatase complexes or protein phosphatase interactions that may regulate signalling pathways critical for human health and therefore encompassing potential drug targets. A major focus of the laboratory is to expand our elucidation of the physiological roles of these protein phosphatases and investigate potential drug targets by variety of techniques including RNA interference in cultured cells and gene targeting in mammals and lower organisms. Left: The hormone glucagon (or adrenaline) stimulates the breakdown of glycogen in the liver to release glucose into the blood when the blood glucose levels are low. 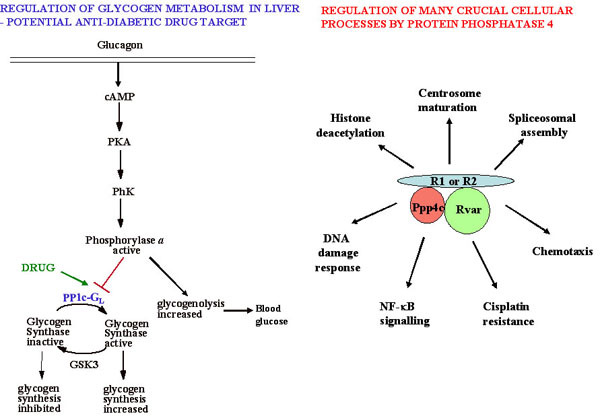 The process is mediated by an increase in the level of the active (a) form of phosphorylase, which also inhibits glycogen targeted protein phosphate 1 (PP1-GL), thus causing a reciprocal decrease in glycogen synthesis. In type 2 diabetes glucose levels are high and hepatic glycogen breakdown and glucose output is elevated. A drug which blocks the interaction of phosphorylase a with GL may increase glycogen synthesis and decrease blood glucose levels. Right: Protein phosphatase 4 regulates many crucial cellular processes by the ability of the catalytic subunit (Ppp4c) to interact with a core regulatory subunit (R1 or R2) and a variable or absent subunit (Rvar). For example, a Ppp4c-R2-R3 complex participates in resistance to the anticancer drug cisplatin in yeast (see ref. 3).